Are Clash Royale clones making any money? Clash Royale has been out for more than a year now, and its influence has already been keenly felt. Like its predecessor Clash of Clans, which essentially established the blueprint by which all other mobile build-and-battle strategy games would thereafter be built, Supercell's latest has been a regular fixture in the top grossing charts and has understandably tempted other developers to ride its coattails. The aspect of Clash Royale that has been most widely adopted is the rewards that unlock on a timer, as adopted in games as broad ranging as C.A.T.S: Crash Arena Turbo Stars and Zombie Gunship Survival. Aping the intricately-balanced, real-time PvP gameplay of Clash Royale is an altogether more complex task, but that hasn't put some developers off trying. One of the fastest to follow was Subway Surfers co-developer Kiloo, with its own lane-based PvP effort Spellbinders. A studio of Kiloo's size and pedigree may have expected to gain some traction by launching just two months after Clash Royale, but Spellbinders has never come anywhere remotely near hitting the heights of Supercell's title. In fact, Spellbinders has never even appeared on the US iPhone top grossing chart that Clash Royale has regularly topped. Even within the games category it's rarely registered, its last placement on the US iPhone games grossing chart being 1,294th on September 15th 2016. It now seems too late for Kiloo to reverse Spellbinders' fortunes. In short, Spellbinders failed to find a paying audience at launch and it now seems too late for Kiloo to reverse its fortunes. Another major mobile game developer to take a swing at the Clash Royale formula is Gameloft, with the military-themed Blitz Brigade: Rival Tactics. Launched at the start of May 2017, more than a year after Clash Royale, perhaps there was appetite among mobile gamers for a viable contender? And surely Gameloft would have the resources to support such a challenge? Alas, the game's grossing performance so far suggests otherwise. Like Spellbinders, it's only intermittently registered in the US iPhone games grossing charts, most recently ranking at 1,301st on May 28th. To delve into another subcategory, the US iPhone strategy games grossing chart shows that Blitz Brigade: Rival Tactics has barely competed even in its own niche. It peaked at 170th here, before dropping to 927th on June 5th and dropping out completely as of June 6th. The outlook for Blitz Brigade: Rival Tactics in Gameloft's native France has been slightly more positive, with the game peaking at 167th in the France iPad grossing charts, but even here it's hardly registered. Gameloft has to now decide whether to double down on Blitz Brigade or accept it as a failed experiment. Gameloft will likely be disappointed with the title's performance thus far, and will have to now weigh up whether it doubles down on the title to reverse its fortunes or accept it as a failed experiment and learning experience. However, the French outfit wasn't the only company to bet on a game in the Clash Royale mould with a military spin. Multiplatform publisher 505 Games launched Battle Islands: Commanders on May 11th, and interestingly on Steam, PlayStation 4 and Xbox One as well as mobile. 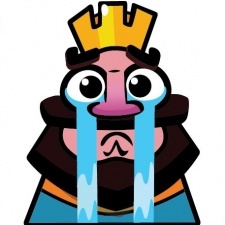 But while it's unclear how it's performed on console and PC (SteamSpy estimates around 200,000 owners on Steam), on mobile it's faced the same struggles as the other Clash Royale-inspired titles. On the US iPhone top grossing chart, it's failed to register. 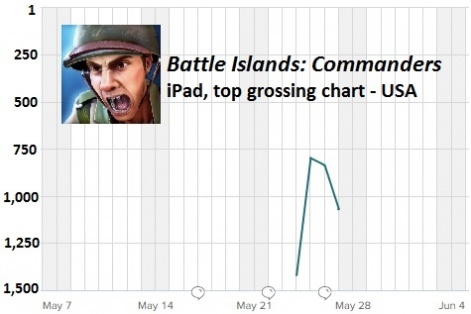 Its peak in the US iPhone strategy games grossing came on its launch day, coming in at 353rd. By June 5th it had sunk to 1,301st. The game has understandably fared slightly better on larger screens, spending four days in the US iPad top grossing charts from May 24th to 27th and peaking at 798th, but it's nowhere near looking like a true Clash Royale competitor. The performance of these three games puts Star Wars: Force Arena - another game with clear Clash Royale inspirations, which is largely perceived as having underperformed - in a far more positive light. Tom Clancy's ShadowBreak, Warzone: Clash of Generals and Titanfall: Assault are just three Clash Royale-inspired titles in soft launch. No doubt buoyed by the strength of the Star Wars license, Force Arena has remained comfortably within the top 1,000 US iPhone grossing, and often in the top 500 - nowhere near Star Wars: Galaxy of Heroes, but outperforming other games of a similar ilk by a long distance. But if Kiloo, Gameloft and 505 Games are all finding this a difficult place to gain a foothold, and even a giant like Netmarble has underperformed with one of the biggest multimedia IP's in the world supporting it, does this suggest that the crumbs from Supercell's table just aren't substantial enough? Of course, there are more developers looking to prove this theory wrong. Tom Clancy's ShadowBreak, Warzone: Clash of Generals and Titanfall: Assault are just three of the many Clash Royale-inspired titles currently soft-launched in various countries around the world. But it feels as though this space is set to be a lot more complex than build-and-battle strategy, with the risks and demands of competing higher and the chances of success far lower. At the moment, Clash Royale's crown remains largely unchallenged. It will take a brave studio to gamble on a power coup. Matt is really bad at playing games, but hopefully a little better at writing about them. He's Features Editor for PocketGamer.biz, and has also written for lesser publications such as IGN, VICE, and Paste Magazine. Spellbinders took 2+ years to make. How is that a fast-follow?